It’s no secret that I love the beaches in Alabama. When I was recently invited to learn more about the work that has gone into keeping the beaches clean, I was excited to visit. The Leave Only Footprints initiative along Alabama’s 32 miles of pristine beaches is designed to keep the beaches alive for years to come. When we all step up our game in paying attention to how we treat our beaches, we all win. By taking care of our beaches, the wildlife and marine life have a safer environment and the ability to continue to thrive. One thing that is always disheartening to me in my travels, is when I step along a coastline and see a mile of trash. I have never seen that along the Alabama Coastline, and this initiative is one way to prevent that from occurring. Most people would think it would be common sense when it comes to what should be found on a beach, but it is not. Did you know that the following are not allowed on the Alabama beaches? If the above things are something that you are interested in, you will not appreciate the beauty that the pristine beaches of Alabama have to offer. I have been on beaches that allow some of the above and I can tell you that I have stepped in dog poop, on glass and stumbled over the remains of a tent structure that were left on the beach. 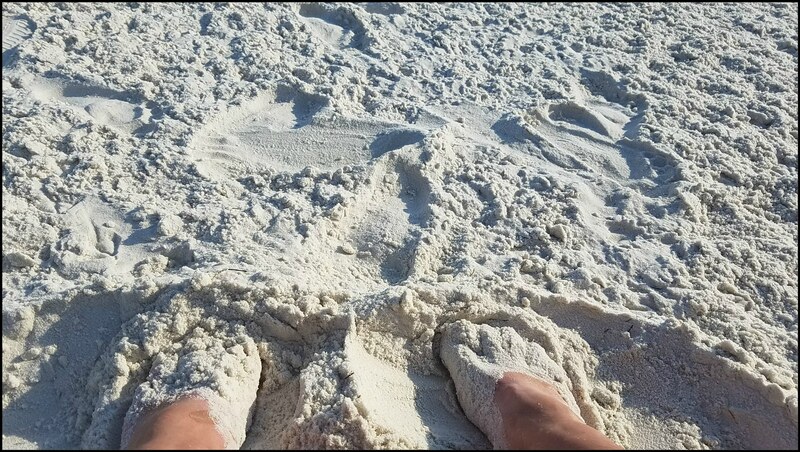 When I spend time on the beaches along the Alabama Coast, it’s all fine, sugar sand between my toes and it’s a wonderful feeling. Many beach visitors are tempted to stroll through the dunes along the Alabama Coast. While you may think the view may be better on top of them, it’s a delicate ecosystem that needs to remain untouched. 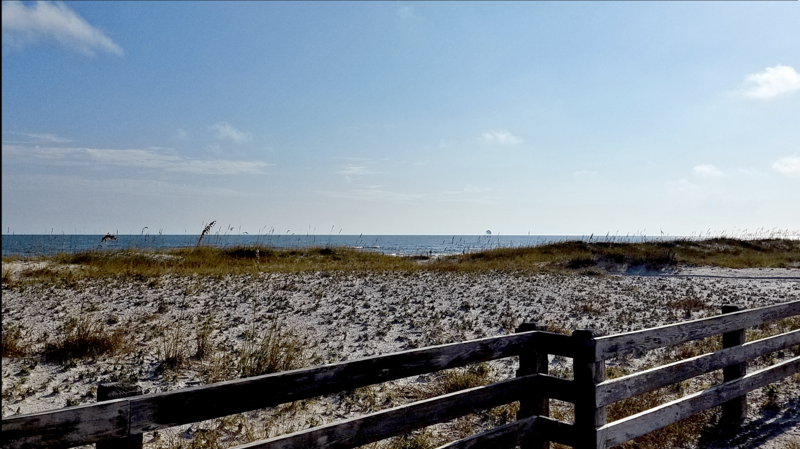 The dunes are a protective area, as they are home to wildlife, fragile vegetation and protect the Orange Beach/Gulf Shores area from storm surges. 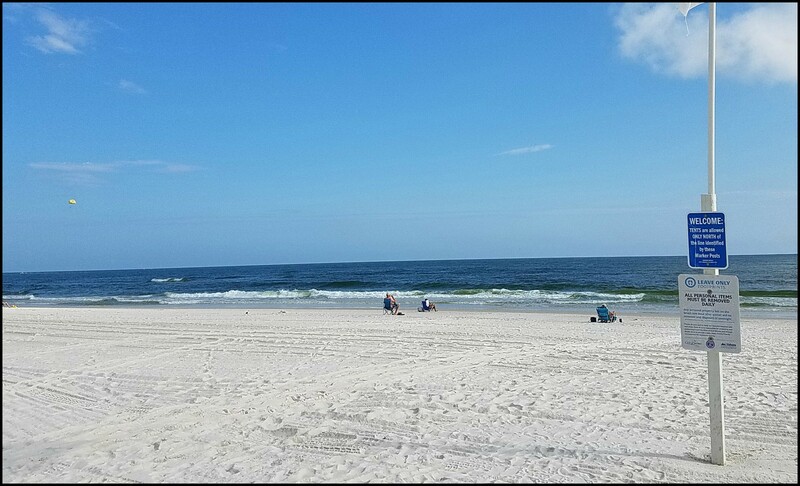 When you spend time on a beach in Alabama, you can expect to find a trash can or two in the parking areas, which are easy to locate. The one thing I loved about this, is that they were easy to see and if someone does see something blowing around, it’s easy to dispose of. 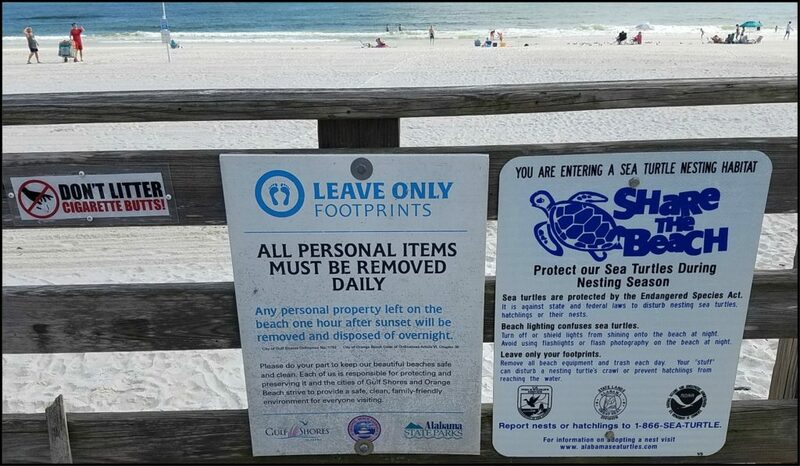 Visitors are greeted with signage that explains the Leave Only Footprints initiative and how they can enjoy the pristine beaches. Most importantly, remember that the beaches are home to marine life and other wildlife, that depend on us humans to keep them safe. When is the last time you made a conscientious effort to keep a beach clean? I’d love to hear how you are stepping up your game in protecting our marine life and wildlife. *Thank you to the Leave Only Footprints Initiative for hosting & inviting me to learn more about this program. 5 Responses to "Leave Only Footprints Along Alabama’s 32 Miles Of Pristine Beaches"
What a great place to buy a condo! Awesome Sara. I swear they should just do this world wide. No joke. All beaches should be clean and pristine. Save the pets and camping and crap – literally – and just enjoy the freaking water and clean sands. Make it pristine. I have been to beaches in tropical paradises that were filthy. All starts with awareness and a commitment to keeping things clean and pristine. We love the gulf beaches! Bought a condo this summer as a rental! Can’t wait to return!!! There’s a lot to be learned from things like this. Simply gorgeous! I love this initiative. It would be great to see similar being done in all parks,etc!